How to remain prosecution free through the development process within a tree’ d landscape? During a recent Chartered Foresters conference on ‘how to remain prosecution free during the planning and construction of development’ the following points are described as best practice, the guidelines for which are followed by Ace of Spades Gardens Ltd.
Landowners pre purchase clients to engage arboricultural consultants for a walkover survey to determine the “the good, the bad or the ugly” sketch of the trees and hedges. This will aid future everyone’s decisions on the landscape use and potential profitability as trees will form part of the planning and construction process constraints. Determine early-on when bats maybe present within trees. Good relations with planning officers and tree officers to determine how trees shall be retained. The local authority experts do also wish to see development go ahead but have to demonstrate that trees are being protected. Tree arising’s such as tree stumps, logs or chip to be used in site. Carve the stumps and logs. Gather tree materials, liaise with the ecologist and create habitat piles. Ensure everyone knows where the protected trees are and what you need to know about the trees. Use the existing trees to create great landscape views with the new development. It is a fact that mature trees within a developed landscape increase the market value of the property and have many health, noise, wildlife, pollution and wellbeing benefits. Tree protection plans should be phased depending of the type of construction. Demolition…. utilities and construction. Follow the method statement as written by the arboricultural consultant. The consultant should be on site giving toolbox talks to the construction staff. Taking site supervision notes and reporting these to the tree officer. Post landscape planting of trees should take place with the tree expert and new residents to educate them and get them to take ownership of the new trees. 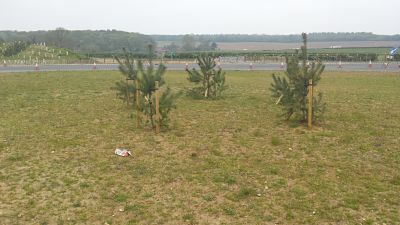 The labelling of trees with care instructions really helps the new landscape take shape and be successful. Tree officers should and will prosecute when trees are not being protected. Felling of trees illegally or unnecessarily. Concrete foundations close to tree roots without consideration of how to protect the tree roots. Dumping of building waste or storage of materials in the space beneath the tree. Parking of plant/construction equipment beneath trees. Felling of trees to obtain easier access to the development site. Trenching through tree roots to install utilities. Not using no dig solutions when developing access over tree root areas. The belief you can develop through 20% of the root protection area without consideration for the tree species. Prosecutions will make the newspapers. Fines are extensive and temporary stop notices cost everyone money. The damage to trees can take years to show but can be detected easily straight away. So maybe it’s now time to talk to a consultant and get this right. Help my trees been TPO’d by the council! Trees and woodlands are often subject to tree protection orders (TPO’s) and located within conservation areas for good reason. One of the reasons for protecting a tree could be that it has a high amenity value which means it is agreeable to look at within the landscape for the community to enjoy. Another reason maybe that it is under the threat of development, perhaps the land has just been sold and the trees are protected to allow them to be brought into the planning process allowing great trees to be built into a development. Historical trees such as the Ketts Oak in Norfolk or special trees such as the London Plane within the grounds of Ely Cathedral, the biggest specimen of that species in the United Kingdom, should be protected when changes to the surrounding land take place. A recent case that we are investigating surrounds a mature, roadside, privately owned beech tree that had been recently TPO’d by the local authority. It is a magnificent tree to look at. We found that the tree was recently badly pruned on one side by a neighbour who employed on the spot door knocking tree surgeons to prune back overhanging branches. They paid cash but it wasn’t cheap. The tree owner is now concerned that tree is now misshapen and which may in our opinion, potentially cause future mechanical problems. It is also suspected that the tree roots are lifting a pathway, buckling a wall, collapsing a drain and causing some building movement. The tree owner contacted several reputable tree surgery firms to obtain quotations for its removal who duly contacted the local authority to check if tree constraints were present. What is interesting is that the local authority noted that several tree surgeons expressed an interest in the tree and suspecting the tree was under threat promptly protected it. The tree owner still has structural damage associated with the surrounding landscape but is uncertain of what is damaging the house. Tree roots entering an inspection chamber. There are grounds to object to TPO’s being placed upon trees which have to be lodged within 28 days of notification, and there is case law where objections to TPO’s on trees has been tested and found in favour of the defendant or the tree owner. As a consultancy we will consider the legal implications and the chances for success should an objection be lodged. If you find yourself in a situation where you have to keep a tree that you would have preferred to remove there are arboricultural solutions enabling the tree to remain whilst preventing further damage to the surrounding landscape. This is what the local authority will advise if they want the tree to stay, you may find that they have stated case law on their side and a fine of up £20,000 for the removal of a protected tree is a good deterrent. If you have any uncertainty of how to manage a problem tree get in touch so you get the best advice from the outset. Contact us by e-mail at info@aceofspadesgardens.co.uk or telephone 01603 487447.